Hrotsvit lived in the tenth century (932–1002) as a canoness of the Imperial Saxon Abbey of Gandersheim (Germany). She can best be described by a catalogue of pioneering achievements: she is the first known dramatist of Christianity; the first Saxon poet; the first female Transalpine [north of the Alps] historian; and the author of the only extant Latin epics written by a woman. According to her own testimony she objected to the great popularity of [Roman author] Terence’s plays, which depicted lascivious pagan women frolicking in the pleasures of the flesh. She wanted to compose dramas substituting the heroines of Christianity: beautiful, chaste virgins, firmly resisting the insidious advances of pagan men. To show “frail Christian virgins” triumph with Christ’s aid was her stated dramatic intent. Hrotsvit is a polished stylist who doesn’t lack a sense of humor, either. In one of her plays, Dulcitius, the protagonist is a pagan would—be executioner of three Christian virgins. He imprisons them close to the pantry so as to visit and seduce them secretly at night. As he enters the pantry, however, he is miraculously deluded and mistakes the dirty pots and pans for the girls. The scene is related by the girls, who peeping through the keyhole observe the foolish Dulcitius romancing kitchen utensils. Hrotsvit’s works were rediscovered centuries later by a German scholar, who in 1501 made her texts available for posterity. Julian of Norwich is perhaps the most famous female exegete of the nature of the Trinity—particularly of Christ’s mediating role between God and mankind. Julian was born c. 1343 and probably grew up in Norwich, England. At some point she chose to live the life of an anchoress, a woman who lives by herself in an enclosed room in order to devote herself to prayer. Her cell was attached to the Church of St. Julian in Norwich. In May 1373, when she was 30, Julian became sick and lay near death. Christ granted her a series of visions, and she recovered miraculously. She set out to record and to interpret her visions and to inspire her readers to a belief in divine love and compassion. Julian’s tone in her Revelations of Divine Love is consistently optimistic: God is good; God is merciful; all will turn out well in the end. Her work also affirms the value of man, created as he is in the image of a benevolent God. Julian celebrates Christ’s mother—like qualities: the nurturing, loving, and protective aspects of his divinity. In deed, this has become the hallmark of Julian’s mysticism. Julian was a mystic, not a theologian, so she emphasizes the importance of devotion and faith, rather than reason, as a way to achieve unity with God. Hildegard (1098–1179) has been considered by some the most prominent Christian woman of her era. She was founder and first abbess of the Benedictine community of Bingen, Germany, but her achievements move well beyond that. In the words of Barbara Newman: “Although she did not begin to write until age 43, Hildegard wrote a massive trilogy that combines Christian doctrine and ethics with cosmology; a compendious encyclopedia of medicine and natural science; a correspondence comprising several hundred letters to people in every stratum of society; two saints’ lives; several occasional writings; and, not least, a body of exquisite music that includes seventy liturgical songs and the first known morality play.” This is especially astounding considering that as far as Hildegard knew, no woman had ever written before. Like many leaders of her day, Hildegard received various visions; these received the approval of the pope. twenty-six of her visions—and her interpretation of these—form her most significant religious work, Scivias, which took ten years to complete. Hildegard wrote to Emperor Frederick Barbarossa as well as to kings and clerics. She also, at age 60, began preaching tours on which she called for reform of the church. The daughter house of Hildegard’s community continues today in Eibingen, Germany. One of the most erudite female saints of the medieval church, Bridget is considered perhaps the finest Scandinavian writer of her time. She was married at age 13. The couple had eight children and experienced a religious conversion while on a pilgrimage to St. James of Compostela to celebrate their anniversary. Bridget’s husband entered a monastery, and she moved to a residence attached to it. Here she experienced the first of her several visions of Christ and conceived of founding a new religious order dedicated to contemplating the passion of Christ and compassion of Mary. Christ himself dictated the rule of the order to her in a vision. Bridget’s Revelations were quite popular in the Middle Ages. They consist of direct speeches by Christ, Mary, and John the Baptist, and striking visions of the torments of Christ and of sinful souls in hell. She traveled to Rome and later to the Holy Land. In Rome she became an important supporter of the church and called for the pope’s return to Rome [from Avignon, site of the church’s “exile”]. Bridget called for church reform and chastised the pope for church corruption. “In thy curia arrogant pride rules,” she wrote Gregory XI, “insatiable cupidity and execrable luxury.” Yet Bridget designated the pope as supreme, and she was canonized shortly after her death in 1373. Clare of Assisi was born as a member of the nobility in the Italian town of Assisi in 1194. At age 18, Clare became attracted to the ideals preached by her contemporary and compatriot Francis. Following his example, she renounced all worldly possessions. Several years later she founded an order for women known as the Poor Ladies of Assisi (later called Clarisses or Poor Clares). Unlike the Franciscans, who were allowed to travel and to preach, Clare’s followers were required to practice their reformist evangelical ideals within the traditional monastic setting. Yet they lived lives of extreme poverty, more austere than any undertaken by women before. In 1228, Clare won from the pope the right to maintain this original vision of extreme poverty. Her order quickly spread throughout Europe; in Spain alone forty-seven convents were founded in the thirteenth century. Clare composed the rule for her new order. She also wrote several exhortatory letters and her Testament, or collection of autobiographical reflections. Accused by her contemporaries of fraud or heresy, and often ridiculed by later scholars as hysterical or even crazy, Margery Kempe was born in Lyon, England, c. 1373, and died after 1438. She was an illiterate laywoman turned religious enthusiast who dictated her spiritual autobiography, The Book of Margery Kempe. It is the earliest known autobiography in English. In her Book, Margery emerges as an intense, honest, devoted human being. Her conversion from religious apathy came when she was at the brink of death. Her subsequent religious odyssey took her to Rome, Jerusalem, Compostela [in Spain], just to mention a few places of pilgrimage. Margery’s frequent fits of crying and shrieking while contemplating Christ’s sufferings, and her practice of admonishing people to return to the path of virtue, created difficulties for her. Her co-travelers almost threw her overboard, and they quickly abandoned her upon landing in the Holy Land. Margery’s message is the exhortation to a simple, direct relationship with Christ based on unconditional faith and fervent love. She repeatedly downplays the importance of externals (such as fasting and the wearing of hair shirts), which, as Christ teaches her, are nothing compared to fervent love and devotion. Lioba (c. 700–782). At the request of Boniface, the “apostle to the Germans,” she traveled to Germany to head the convent of Tauberkirschofsheim. Her letters to Boniface survive, as does some of her devotional poetry. Her vita records that she was so devoted to the Scriptures she had younger nuns read them to her while she slept; if they skipped a word, she would awaken and reprimand them. Anna Comnena (c. 1083– c. 1150), daughter of Emperor Alexius I of Byzantium, composed a history of her father’s reign. Called the Alexiad, the epic remains the chief primary source for our knowledge of the period. Frau Ava (1100s), having lost her husband and eldest son in a crusade, retired to a life of prayer, probably near a monastery in Melk, Austria. She composed a poetic version of the New Testament. Elizabeth of Thuringia (or Hungary) (1207–1231) was the daughter of King Andrew II of Hungary. She was betrothed at age 4, and married at 14, to Ludwig, Count of Thuringen, who died six years later. Elizabeth devoted herself to the poor and the sick. According to one legend, Elizabeth was distributing bread to the poor, contrary to the direct orders of her husband’s brother, Heinrich Raspe, who feared her charitable acts would deplete the state treasury. When he confronted her, however, the loaves were miraculously turned into roses. In Marburg she established a hospital for the poor. Mechthild of Magdeburg (c. 1207– c.1280) is one of Germany’s most outspoken and famous visionaries. Her criticism of corrupt clergy earned her much hostility. While ailing and almost blind, she composed her main mystical work, The Flowing Light of the Godhead, a collection of visions, parables, reflections, and advice clothed in courtly images: Christ is emperor, king, knight, or lord; he bestows rich gifts and lovely garments on the deserving souls gathered at his court. She is an original thinker and ardent advocate of a personal, uncompromising, intense devotion to the service of God. Hadewijch (writings c. 1221–1240) is probably the best known of the Dutch mystics. She was a beguine, part of a revival movement in which women chose lives of charity and prayer without belonging to an established religious order. Beguines often had reformist ideas; as a beguine, Hadewijch was subject to some criticism. In her letters, she encourages people to help the needy and to devote themselves to an ardent love of God. Her mystical writings center around the idea of minne, or love, which is the human soul’s longing for the Divine. Gertrud “the Great” (1256–1302) spent her life in the Cistercian monastery of Helfta, Germany, a famous center of mysticism in the thirteenth century. Venerated by the people, Gertrud was viewed with some suspicion by the church hierarchy. Her visionary text, the Messenger of Divine Kindness, celebrates an intensely personal union with God. Dr. Katharina M. Wilson is Professor of Comparative Literature at the University of Georgia and editor of Medieval Women Writers (Georgia, 1984). 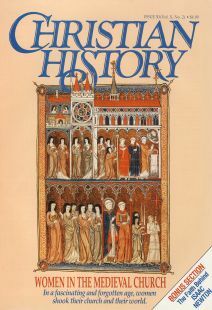 Chronology of some key events pertaining to Christian women in the Middle Ages.